You won’t find multinational-owned drinks in the fridge, but we also know you don’t mess with a human’s need for Vegemite. Crunch café serves up a range of delicious homemade, home grown and locally sourced food that both looks and tastes amazing, reflecting the interests and philosophy of its owners, Mat & Amy. Open from Tuesday through Friday from 7.30am – 3pm, and from 8am until 3pm on Saturdays and Sundays, Crunch is situated on High Street in Thornbury, Melbourne. The Number 86 tram runs right past. Get off at Stop No.37 at Woolton Avenue, whether heading north or south. Croxton Station on the South Morang train line is only a short stroll away. Warm and welcoming on a cold day and cool in summer, Crunch has both indoor and outdoor seating, friendly table service and, of course, great coffee. Crunch also provides catering services. 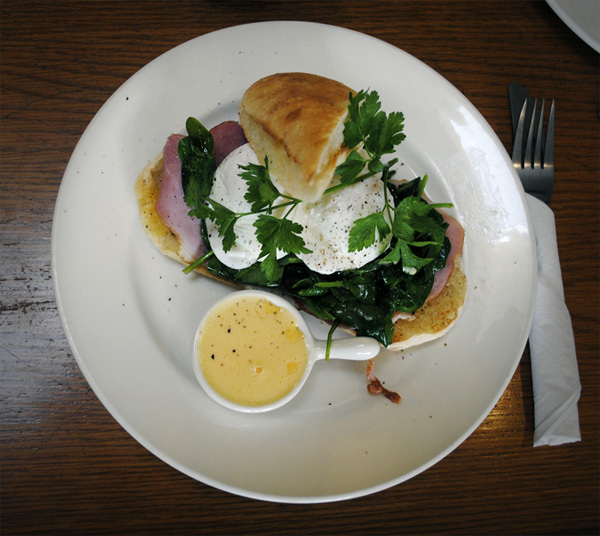 Crunch’s ‘Green Eggs & Ham’ features the best ham in town, sourced from local small goods supplier, Velimirovic Bora.